So, my post today is in regard to black trim. I know I love it, that's not the question. It will be making an appearance in my small foyer for sure. BUT, after seeing these pics, I am tempted to expand my vision. Grow a little more in the guts department, if you will. I told a friend what I was planning and she looked at me from a side eye with apprehension. She wanted to trust that I wasn't off my rocker, but I don't think she could quite get there. That's ok. I like a bit of crazy, as my husband would a little too freely acknowledge. So, if I decide to jump completely on the crazy train and do more than just the foyer, it will probably be similar to the first pic, with the crown molding staying white and the base molding going black. But, then where does it stop? Do I do the whole stinkin' first floor? I don't know if I'm on board for that. I'm all about drama...but, I'm not sure I want to live in a show house. Plus, would I get tired of it, once the novelty wore off? It's so funny, other people are finding the cure for cancer and I am all discombobulated over whether or not to continue black trim throughout the first floor instead of just the foyer. I guess I need to remind myself, it's just paint. Not life and death. Good grief I get so worked up. So thoughts people? Jump on the crazy train with me. We are dying for this trend as well. It is super dramatic and elegant. Adore! Those are gorgeous! Very dramatic and elegant. I say go for it!!! Nichole, I am totally with you on the black trim, and agree that it's difficult to decide where to stop! Is it going to be house-wide detail or limited to just a foyer like you said? Can't wait to see what you decide! drama, drama, drama, girl!!!! Go big or go home! I've been contemplating using black trim also! I love it, but I'm also wondering where the best place to use it is. I keep reminding myself that it's only paint and that it can easily be painted over once I need a change...which for me is usually quite often! In the right space, the black trim looks really beautiful. I'm quite surprised, I like it. It's different. That chandelier is to die for in the first picture, stunning! I like the idea! I'm dying to give my guy's place the black trim treatment- doors, crown and base. Start with the foyer and live with it. Maybe you'll be itching for more, or maybe it will be enough. Just make sure you share the results! I love black trim, I have an entire board on Pinterest dedicated to it. But we have lived in rentals for the past few years so my love of black trim has gone unrequited. Start with the foyer, see how you like it. You can always expand. I'm all for it! but I agree, the entire first floor might be a little much. 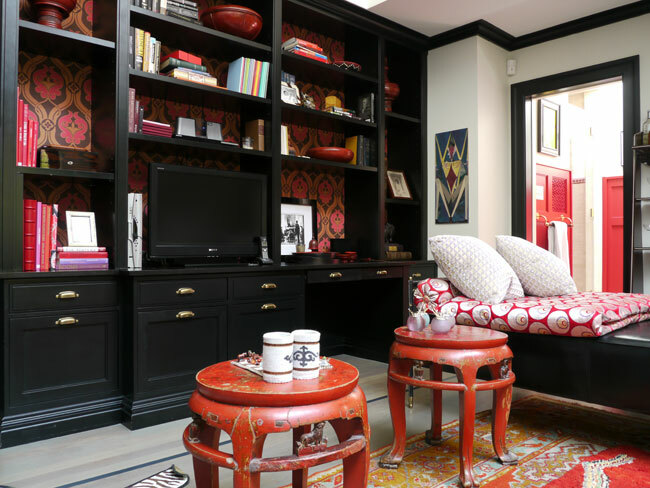 I love the black trim, but to keep from opening a can of worms situation with where to start/stop keep it to the more intimate spaces of the home, dining room, study, powder room...those are always areas that I like to punch up the drama since guest frequent those spaces. And, I love black doors. Try doing just your foyer. Hard to say without knowing where the walls stop etc, but like you said, its just paint! Love black trim--so glam, so grounding. If you do more than just the foyer, you're definitely in it for the whole first floor, with the possible exception of the kitchen, which often feels sort of stand-alone to me. I would say just do the foyer and live with it for awhile to see how you truly like it. Then move on to more of the house. I had the same issue when I was only painting my cream trim white. I didn't have time to do the whole house at the time so I stopped where my eye stopped. So on the door frame, I did the part next to the wall but not the inside of the door but I think that would be really tricky with black. I love black trim though. You may have to do the whole first floor. Good luck. I'm SO with you on this- I want every trim/door/window black...like yesterday. I'd start in the foyer and see what you think. I love it, so dramatic! Personally I would be scared to do an entire floor but if its true to your style you might just love it for good. My neighbors have very dark gray trim and doors but white crown moulding. I think the white crown helps the ceiling look higher. I think it's a great idea.